Number 1 on Steve Barker's top ten albums of 2011 on Boomkat as well as being Steve's favourite album of the year in the Wire Magazine. Number 52 on Uncut Magazine's "Wild Mercury Sound 100 from 2011. It takes a lot to stand out from the morass of post-Takoma guitarists currently operating, but with 'Son Of The Black Peace,' Mcphee manages just that. A large part of that is down to his remarkable restraint and appreciation of space (notes are permitted to hang in the ether, adorned only with the faintest touches of tremolo, reverb and delay), but it's Mcphee's ear for a heartbreaking (but never obvious) melody that has me returning again and again to this quite beautiful album. This English guitarist's first full-length is just as impressive as last year's excellent Brown Bear EP, but displays quite a significant and somewhat unexpected evolution. Rather than playing up the psychedelic touches and constant sense of motion that made his earlier work immediately gratifying, Dean has taken the more difficult and distinctive road of shifting his emphasis more strongly towards space and decay. Thankfully, his melodies are usually strong enough to support that potentially perilous decision. As a result, Son of the Black Peace is as much a bold artistic statement as it is a great album. 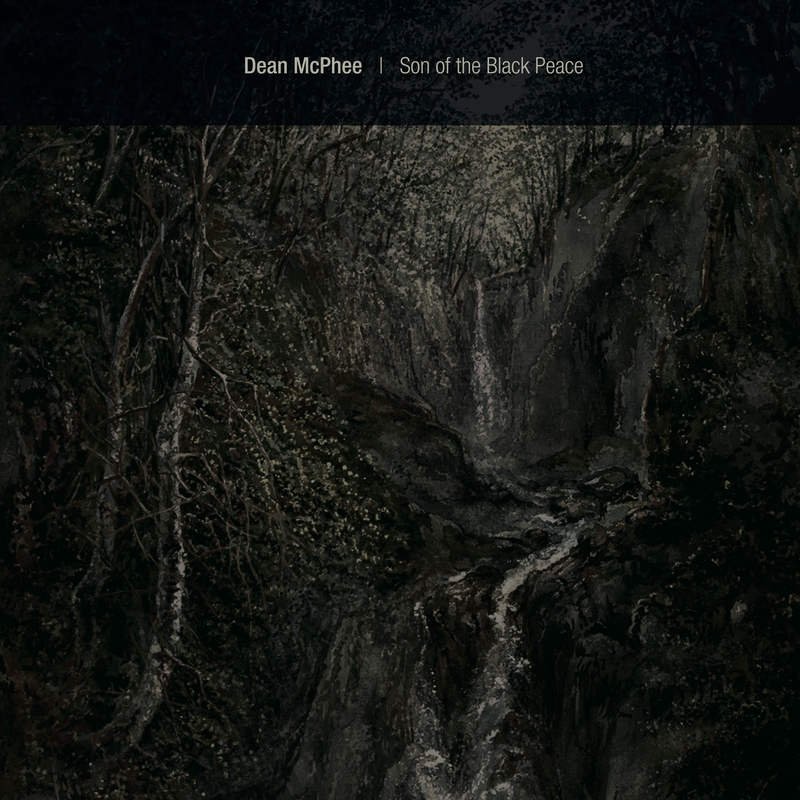 The one thing that most fascinates me about Dean McPhee is that his style is so difficult to deconstruct: he isn't doing anything ostentatious or overtly experimental, but there is no clear chain of influences leading to his sound. There are definitely some subtle nods to Takoma Records, jazz, and contemporary pedal-stomping experimentalists, but Dean seems to built upon their tactics rather than their content. These four songs sound like traditional folk-inspired steel-string instrumentals that have been electrified, softened, slowed down, blurred, and improvised into something new. McPhee is quite adept at weaving strong melodic motifs, as he proves with both the opening harmonic reverie in "Power of Nines" and the Eastern-inspired central riff of "Golden Bridge," but the true depth of his artistry is a bit deeper and less immediately apparent. Dean wields his battery of pedals in a remarkably nuanced and ingenious way, using delay and chorusing to keep notes hanging and shimmering in the air like a fog. That nimbus of gently quivering decay holds the pieces together (kind of like drone music) and eliminates the need to stay busy or play a lot of notes just to keep the songs' momentum going: Dean is clearly trying to bring as much sensitivity and feeling to his notes as possible. He wants them to matter. Well, perhaps not quite all the time, as another great facet of this album is that almost everything McPhee does is essentially a fantasia on a theme. The basic framework of these pieces is often merely a jumping-off point for endless variations and improvisations. That tendency could be quite tedious in the wrong hands, but Dean has a knack for deftly and unexpectedly locking back into the melody in a tight and oft-striking way. At times, I wish he would stick a bit closer to the song's core (particularly when there is an especially likable melody), but I still enjoyed the low-level tension of wondering how he is going to pull things back together. He even managed to surprise me a bit near the end of "Cloud Forest," as he wields feedback in a way that weirdly approximates a singing saw (while still maintaining a skeletal chord progression, no less). Notably, this album was recorded in single takes with absolutely no overdubbing (apparently in a single afternoon, even), yet it sounds like the end result of a lengthy and painstaking process of distillation. In fact, Son of the Black Peace feels like such a product of restless and exacting perfectionism that it seems like it only could have been recorded in this fashion–it needs that organic, spontaneous feel as a counterbalance to make it all work (which it certainly does). Some of McPhee's artistic decisions (increasingly abstract divergences, fewer attention-grabbing "set pieces," etc.) make this album a bit less immediately accessible than its predecessor, but it is worth the effort to get past that. I'm admittedly a little concerned about how dangerously close Dean is to crossing the line between "refreshingly reflective and understated" and "languidly meandering," but he is staying on the right side pretty damn consistently at the moment (it helps that he keeps his releases somewhat brief though). If it finds its way to enough ears, this masterful and subtly mesmerizing effort should quietly ensconce McPhee in the upper echelon of contemporary solo guitarists (which is exactly where he belongs). One man, one guitar, and no rushing — that's what it took to make Son of the Black Peace. It's the first full-length release by Dean McPhee, an Englishman whose inspirations have little to do with either the Britfolk revival or American Primitive models currently in vogue. If you have to sketch a lineage, I hear a bit of Mark Nelson (Pan•American, Labradford) and Alan Sparhawk (Low), maybe a bit of Les Paul, and definitely some Vini Reilly (Durutti Column). There's also a superficial similarity to Marc Ribot's Silent Movies, founded mostly upon similar taste in tones and reverb settings. But where Ribot seems intent upon evoking a cinematic past, the only scenes that McPhee plays out are in his head. He sounds like a guy who has spent enough time with his instrument to have not only mastered it, but to get beyond any notions of showing off what he knows. McPhee makes no effort to impress; he's too concerned with putting every note, every liquid squeak, and every subtle swell of volume or reverb right where it needs to be to make his melodies register as more than mere tunes. Song titles like "Golden Bridge" and "Star Burial" (one of a series, apparently — McPhee's shorter-form efforts also include burials) leave a lot to the imagination, but the deliberation with which he articulates his material seems very purposeful and specific. Each change of pace or attack comes just when it needs to come to sustain the narrative flow. McPhee reportedly recorded the album in an afternoon, but I bet he spent quite some time working this stuff out, and that clarity of intent makes this an album to turn to when you're inclined to put yourself in the hands of a man who knows where he wants to go. 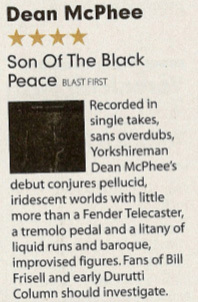 "On his debut album, Yorkshire based solo electric guitarist Dean McPhee delivers four lengthy pieces, all recorded in a single take with no overdubs. Subtle use of volume pedal, tremolo and echo delay gives his Fender Telecaster, an instrument known for the sharpness and clarity of its sound, a sweet and luminous tone. The hallmark of McPhee's style is a picked bassline and free-ranging variations on melodic ideas via a mesmerising progression of harmonics, cleanly picked notes, full chords and string-bending arab-esques. This gradually yields a multifaceted structure, as exemplified on the nine minute opener "Power of Nines". McPhee's playing is mostly tonal, although towards the end of "Golden Bridge", with its more straightforward, almost folky lines, he lights upon some outré chordings. These recall Bert Jansch, but a combination of his avowed influences, Ali Farka Toure, Jimmy Page and Captain Beefheart among them, explains his approach just as well. Son of the Black Peace is a 37 minute gem of an album, and the best is left until the last four minutes of "Cloud Forest", which closes with a beautifully played coda of slowly picked motifs and simultaneously sustained feedback". Son of the Black Peace is the sound of being alone with one's thoughts; like a monologue that unravels contemplation into a smooth, clear narrative in which each emotion and thought is carefully pronounced out loud, one at a time. It's the sound of being at peace and in a state of mental clarity, free to move between each note and chord without the distraction of any external influence. Each of these four pieces unfolds in the most unhurried manner, yet such a blissful disregard for time means that the whole experience passes incredibly quickly. The album is entirely comprised of Dean McPhee's solo guitar, dusted with a reverb that creates a sense of absolute solitude in a vast, empty place. 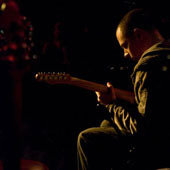 With the exception of the excellently-judged wail of Ebow on "Cloud Forest", the sound of McPhee's fingers plucking each note dominates, inflected with tiny morsels of error (caught frets, string scrapes) that repeatedly bring the album back to the enchanting intimacy between a human player and his instrument. He's undoubtedly an accomplished guitarist, although never is Son of the Black Peace a shameless demonstration of skill. Melody – and the emotion that drips through it – always takes precedence, and McPhee joins the likes of James Blackshaw in utilising effortless instrument understanding to create an unrestrictive, beautifully fluid synonymy with the guitar. Rather than command his instrument, McPhee dances gracefully with it. Even for a relatively experienced critic, sometimes describing – let alone judging – music can be like nailing jelly to a wall. Certainly, someone who falls into this hard to nail-up category is West Yorkshire's solo electric guitar man Dean McPhee. Trying to unpick and trace what makes his muse work – and work so well – is a tough ask when this writer would just like to say that this 4-track debut LP is a dignified and serene 36 minutes that no serious fan of instrumental music should fail to investigate. But of course, you need more explanation to instigate such a search in a world chronically overflowing with new and old releases, so it falls to this listener to dissect but hopefully not lazily label-up Son Of The Black Peace. Picking-up where 2009's similarly sculpted but shorter Brown Bear EP left-off, this full-length follow-up continues a deep sonic journey into lengthy pieces that seamlessly meld wide – but far from obvious – influences into seamless wordless meditations. With hard scrutiny it feels that inspiration may have come, directly or indirectly, from the most experimental wares of Bert Jansch and John Renbourn (albeit refracted from acoustic to electric aesthetics), the production values of 4AD's atmospheric '80s lynchpins, the languid explorations of The Durutti Column, Mogwai's most melancholic moments, Pan-American's nocturnal minimalism and Fripp & Eno's enigmatic Evening Star. Moreover, there are perhaps even shades of medievalist folk and African desert-rock buried in McPhee's palette. However, all such reference points blur into a cohesive elemental sound, so that the whole of Son Of The Black Peace flows, laps, ripples and churns as one bleak and beautiful entity. Ultimately, this is an impressive and uncompromising album that answers to no-one besides its creator's gifts for conjuring mesmeric moodscapes with merely six-strings and some effects pedals. Overall, as take-it-or-leave-it artistic statements go, Son Of The Black Peace leaves a firm impression of a fledgling talent blooming in a solitude of his own making. Recorded live in single takes with no overdubs, Son of the Black Peace is the sound of one man armed with an electric guitar and a few pedals bringing into being four long-form tracks of introspective drift and beauty that are more than a little capable of mesmerizing the receptive listener. 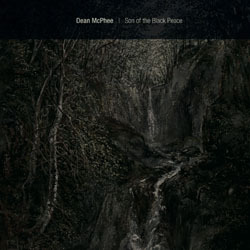 The man in question is West Yorkshire-based Dean McPhee, who demonstrates no shortage of sensivity to nuance, texture, and, lest we forget, melody on his first full-length album (an EP, Brown Bear, appeared in spring 2010). In terms of playing style, McPhee deftly accompanies himself by grounding the pieces in bass figures and layering on top sharply delineated melodic lines. A rich range of timbral effects characterizes his sound: hints of Eastern modality emerge in the curlicue shapes he sometimes voices; a chiming quality also appears in both the chords and picking; and a wide-screen ambiance surfaces, too, in the subtle shadings of tremolo and echo that shadow his ever-so-fluid attack. While a mood of peaceful resolution colours the unhurried ruminations of "Golden Bridge," the ease and elegance with which McPhee pursues the melodic trail on the stately "Star Burial" is just one of many special moments captured on the recording. "Cloud Forest" brings all of the album's strengths together within a single setting, with McPhee first indulging in some slide-styled playing before easing the piece out with four ghostly minutes of beautifully controlled E-bow swoop and sustain. While clearly an accomplished player, McPhee has no time for virtuosic self-indulgence; his artistic focus is instead on lyricism and in-the-moment sensitivity to overall tonal colour. In its understated way, Son of the Black Peace is spectacular and immensely satisfying music, even if, at thirty-six minutes, it's over quickly.